This was the first drive of a project to be fulfilled over the next 12 months (ending May 2007). It is my intention to drive every road available to the public. Armed with a GPS, camera and recorder I will try to chronicle the interesting sites and events encountered and there will undoubtedly be many of these based upon my first 5 day trip in May 2006. 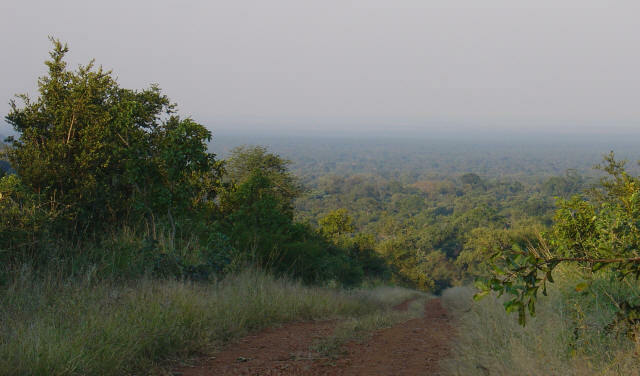 The maps include waypoint symbols indicating interesting locations and/or events that visitors to the Kruger National park may want to explore further for themselves. Where you see co-ordinates these are based upon a decimal system rather than degrees, minutes and seconds as you will see in the next paragraph. Many images on this Kruger Park gps and map-based site will be in thumbnail view so click these to see the enlarged image. 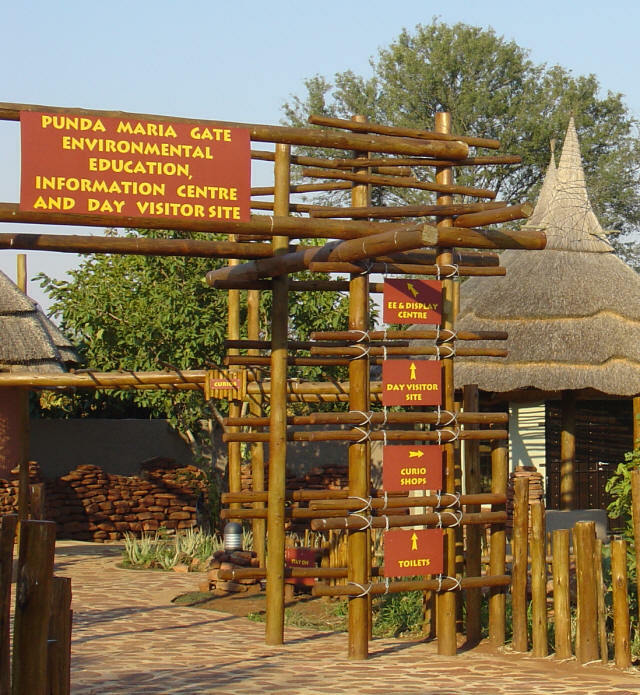 The drive from the Punda Maria Gate (S22.73741 E31.01022) in the far northern part of Limpopo Province to the Punda Maria rest camp is about 10 kms only with a interesting detour to the left. 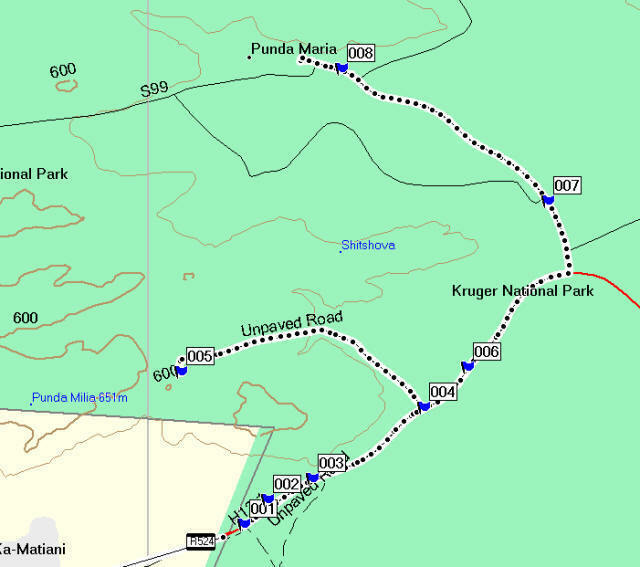 The map shows the route to the camp along with the drive to an observation point overlooking the vast plains to the south of the Kruger National Park. Shortly after entering the park I saw the first of many Impala, a most graceful and beautiful antelope or bok as we refer to them in South Africa ... by the way there are no Springboks in the Kruger National Park. Thulamila is a flat topped hill with a very obvious slope and this is where the name is derived (Venda word for hill slope). When I did the drive in mid May 2006 the trees on the south facing hillside were looking magnificent with the autumn coloured deciduous types contrasting vividly with the evergreens. This second higher resolution map ... see bottom right for scale, also show that the bush to the right is relatively flat and sparse in terms of woodlands. Those plain green areas are not flat grass but rather what we call bush or shrubby type plants as distinct from a treed (woodland) area. Waypoint 001 marks the day visitor centre which is a well constructed series of buildings for use by those thousands of visitors who visit this out of the way part of the Kruger. 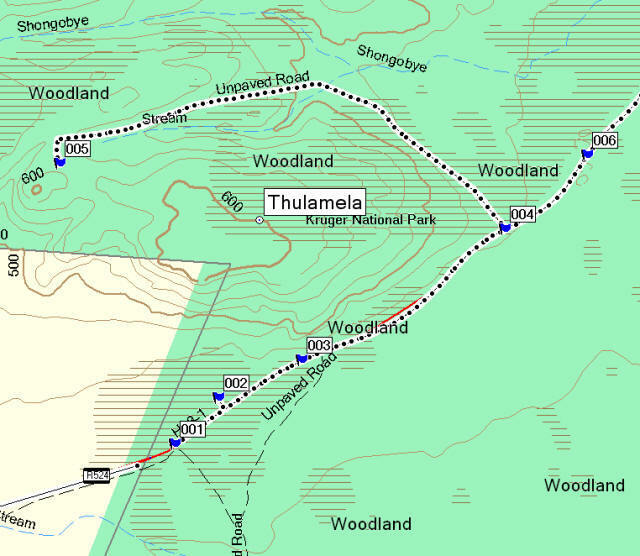 Waypoints 002 and 003 give excellent views of Thulamila hill and 004 marks the turn off to the Thulamila view site ... do this short 3 km cul-de-sac trip and revel in the bird and plant life so close to you. I saw many types of birds on this short climbing drive up to 563 metres at the top (the road was at 450 metres level). 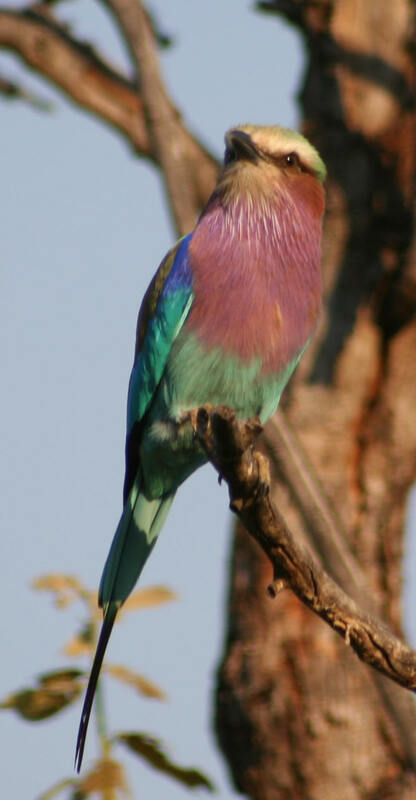 On this short initial drive it was interesting to immediately see that most beautiful bird, the lilac breasted roller bird. This bird is very often seen sitting on a high branch of a tree (preferably dead or leafless) perusing the roadside for its next meal. Once spotted the lilac breasted roller swoops down, catches its meal and returns to its lookout point. It is a site all visitors to the Kruger will see many times. The roller bird is not quick to fly away and makes an excellent photographic subject. In this same area it was entertaining to see those masters of aerial acrobatics, the all black fork-tailed drongos catching flies on the wing. Waypoints 002 and 003 give excellent views of Thulamila hill and 004 marks the turn off to the Thulamila view site ... do this short 3 km cul-de-sac trip and revel in the bird and plant life so close to you. I saw many types of birds on this short climbing drive up to 563 metres at the top (the road was at 450 metres level). It was on this drive that I saw a curious fruiting plant ... the fruit was round and heavily spiked green and pink in colour and, in this respect reminded me of an apple colouration. 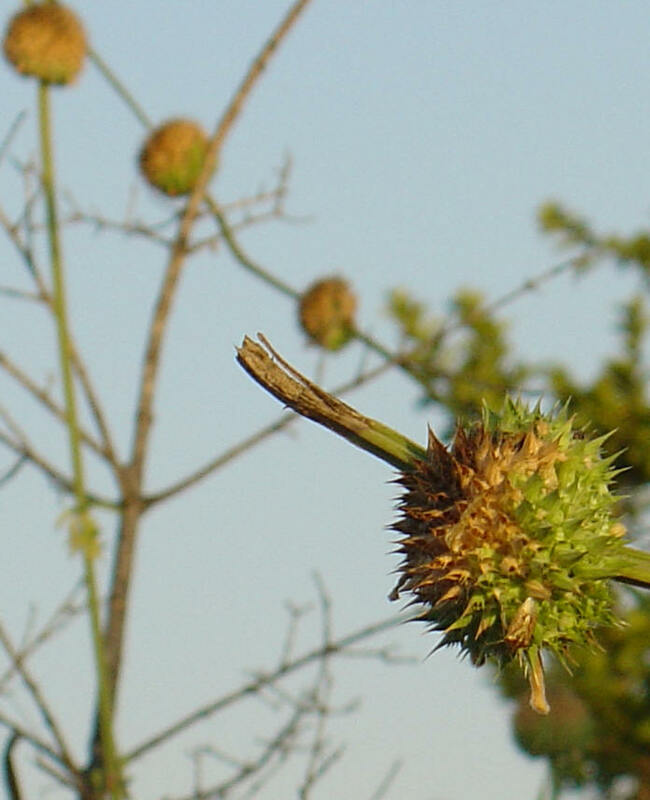 Other then the colour and spiky nature what was intriguing was that the fruit grew in series one after the other up the stem as you can see on the picture. The fruit are eaten by ground squirrels amongst other animals. I think this plant is Leonotis leonurus also known as the wild Dagga plant without having anything to with cannabis, I'm told. Driving down the hill to rejoin the main road to Punda Maria camp presented splendid views of the country that I would be exploring over the next few days. 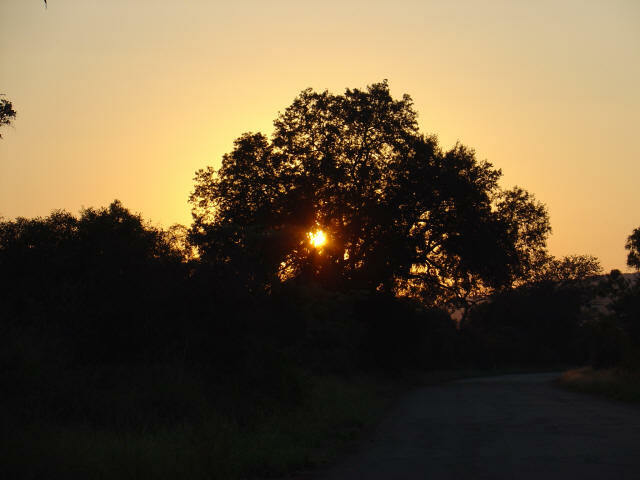 The Kruger Park is a massive area the size of Wales covering around 20,000 sq kms. The scenery, geological structures and variety of ecosystems is enormous and varied. This is what the site is about ... to show intending visitors what a treat lies ahead and why a couple of days is just not enough. However if that's all you have then the site will help you decide upon which area you would like to visit first ... because undoubtedly you'll be back. I arrived at Punda Maria as the sun was setting ... gates close at 17.30 hrs during winter. On the way I had excellent views of South African Shelducks (the male has a distinctive broad white stripe covering most of the head) and the haunting fever trees close to the camp area. A wonderful site of a baobab tree was experienced on the way and of these ancient trees I was to see and admire many more over the next 5 days. Baobabs only grow in the warmer frost free climates of South Africa and typically start around the Tropic of Capricorn latitude. The camp at Punda (means striped donkey ... a reference to the zebra) Maria is small and still has the old terraced type of accommodation with low thatched roofs. Like most camps it is possible to camp and caravan here and there is a restaurant and small shop as well as a petrol station.